This is some test footage shown by Jeph Loeb, head of Marvel TV, at the New York Comic Con that currently is in progress. 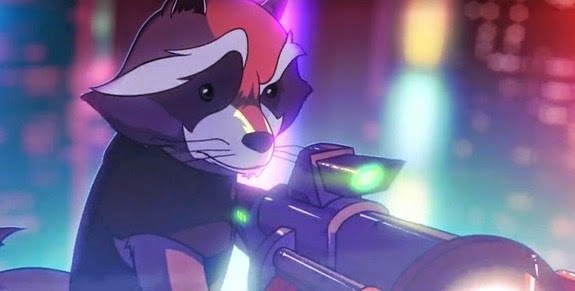 Aside from a lot of other stuff, he showed some test animation footage featuring Rocket Raccoon running and gunning. Peter Quill stood there, in full movie garb with the disappearing helmet, and they officially announced the rumored Guardians of the Galaxy animated series. The series will premiere in 2015 on the Marvel Universe programming block on Disney XD. Below is the test footage. It's kind of unusual to see real footage at such an early stage, so it's kind of cool.